Hi everyone - today we are pleased to announce the lucky, random winner of our sponsor's prize and the pinworthies selected by the design team from last month's challenge. 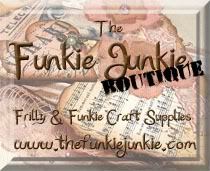 I’m so excited to be here at AVJ, among the talented and creative designers and crafters! I would like to say thanks to the AVJ team for the possibility to let me show one of my projects. My name is Monika, I am Hungarian but I have been living in Luxembourg for more than 10 years. I am 42 and married. I also have a daughter (9) and a little dog, a Bichon Bolognese. 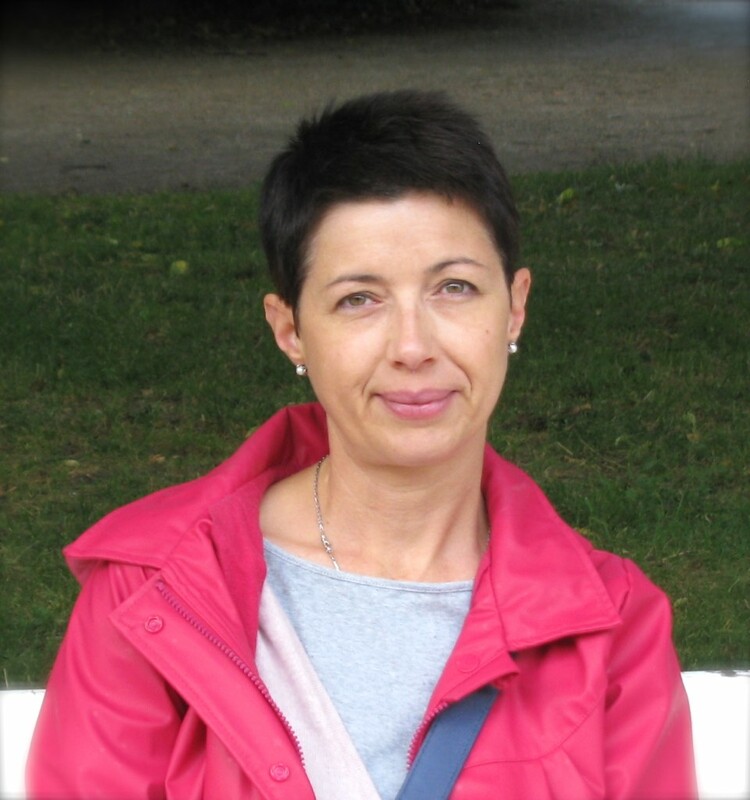 As an expat wife I had to find some activity not to be bored, so first I started to write a blog about the Luxembougers, about their country, their history and culture. 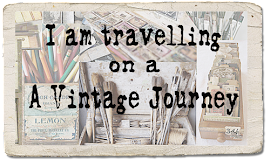 And meanwhile I made handmade objects: decoupage boxes, felt decorations... and I decided to share it with others and to blog about it. Since I wanted to cut out the felt in an easier way than scissors I have found the Sizzix! And it was a revolutionary meeting because a whole new world opened to me. I prepared nice decorations for my daughter’s birthdays and other celebrations, I became a card-maker and I got a new addiction: making mixed media canvases. 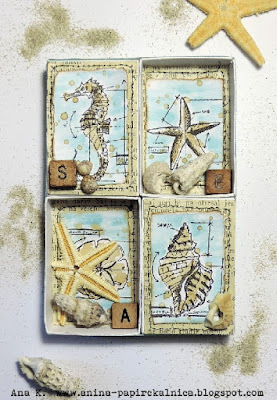 When I studied the Sizzix I started to get to know the designers of the Sizzix too. They are all talented but I had to tell you that I'm totally hooked on the forms and the style of Tim Holtz’s products. And here, ladies, I am sure that I am not alone with this feeling. If you would like to know more about me, just click here - because here, I think, it’s just enough about me. 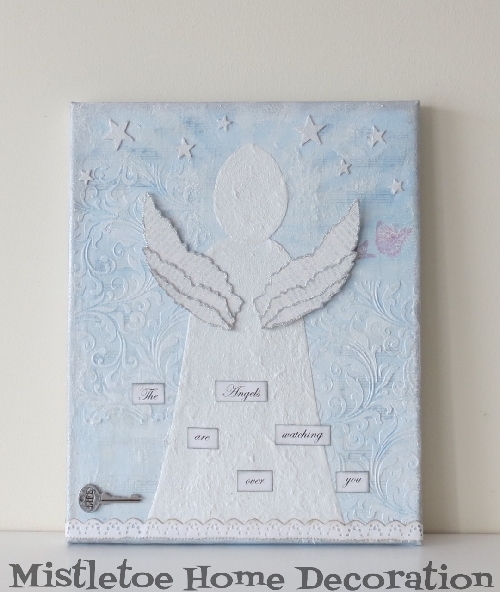 For the August challenge I have brought a mixed media canvas with an angel. When I first heard the theme of the August challenge: wings, I was so happy because I have many dies and stamps from Tim’s butterfly and bird collections. 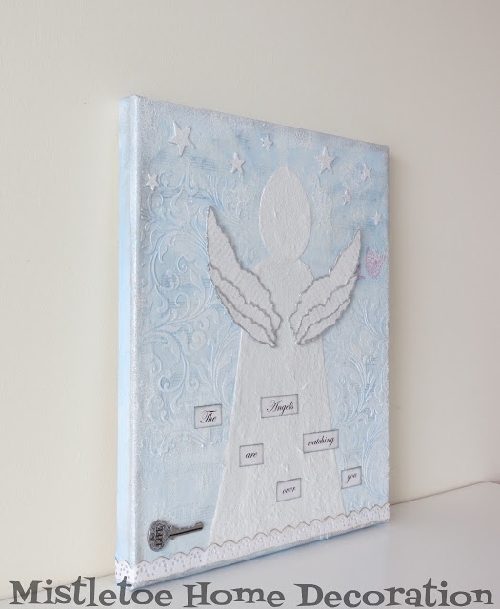 But as usual I wanted to make something different and finally I chose Tim’s Layered Angel Wings. I created this canvas for my daughter into her room. I wanted to make a clean and quite simple canvas with a comforting sentence for a girl with vivid fantasy. "The angels are watching over you." Here, on the surface, you can see fine crackles. For achieving them I used Ranger Distress Clear Rock Candy Crackle Paint (one of the best crackle medium ever). Oh, I just love the Vintage Lace Die - I very often run it through my Big Shot. I rubbed a little white paint onto the key. This is a key for LIFE. I put some gesso on the stretched and primed canvas, then I glued some torn music sheet papers on it. 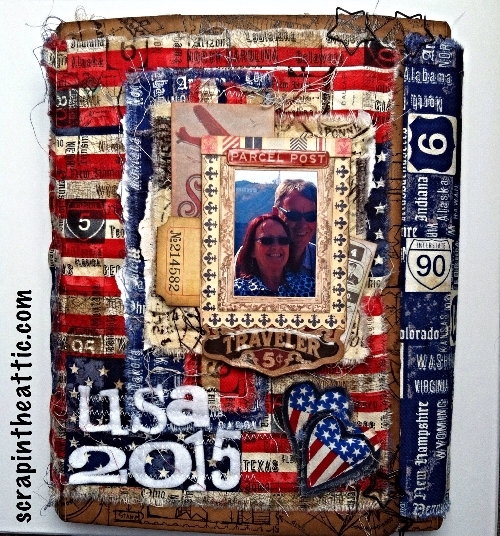 After I used Tim's Flourish Layering Stencil. When it was dry I rubbed some light blue acrylic paint with a sponge on the surface. For the halo around angel I used Tim's Rays Stencil. It was me who drew the shape of the angel. I cut it out with scissors from handmade paper and after I put two layers of white paint on it. I wanted just a silhouette angel because my goal was to enhance the wings. 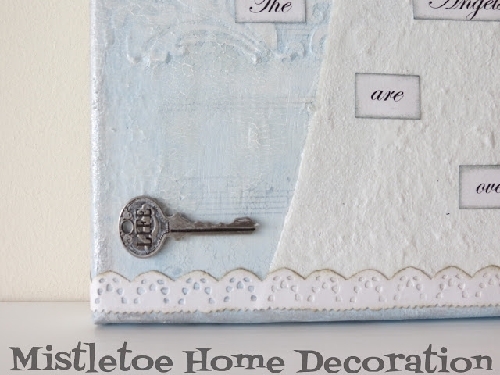 If you want to see how I made this canvas you can find more pictures and a detailed tutorial on my blog, the Mistletoe Home Decoration. Thank you Monika, what a beautiful canvas for your daughter - I am sure she loves it! So onto the winner and pinworthies for our August challenge - Destinations. 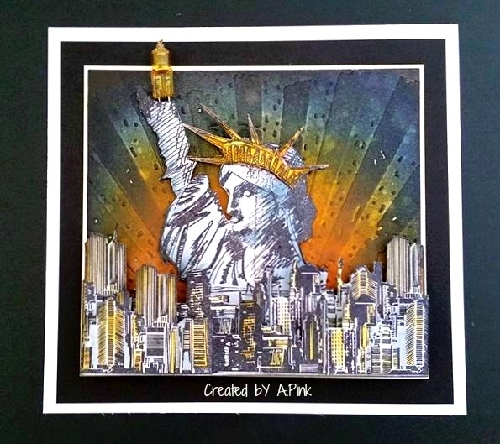 Our winner is Ana K - who created this wonderful, dreamy project using the matchbox die and blueprint stamps. 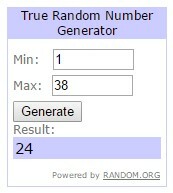 Congratulations Ana - we hope you will be a guest with us at AVJ and your voucher and winners badge will be sent to you. 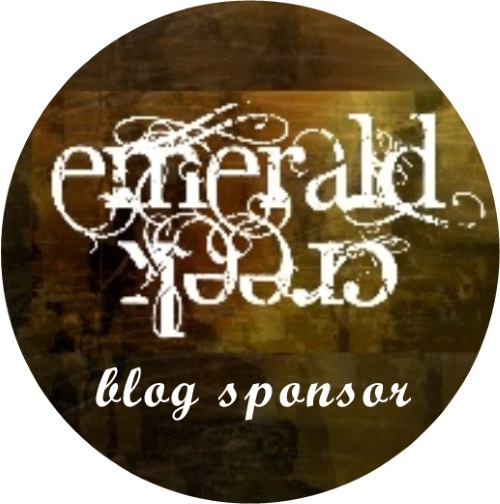 Well done to you all - your blog badges and invitations will be on their way to you soon. Our current challenge is Things with Wings - so do join in and we would love to see you back on Monday for our next Destination Inspiration post. Monika, your canvas for your daughter is really beautiful, the crackling and texture in the background are wonderful and I just love the beautiful layered wings! Thank you so much for sharing this with us. Oh Monika your canvas is amazing!!! I love the soft textured background and I totally agree about the Ranger Clear Rock candy crackle paint, - it's brilliant and you used it so well in your project! Your angel with the layered wings is so beautiful too and has a real protective feel to it. Your daughter is going to love it! 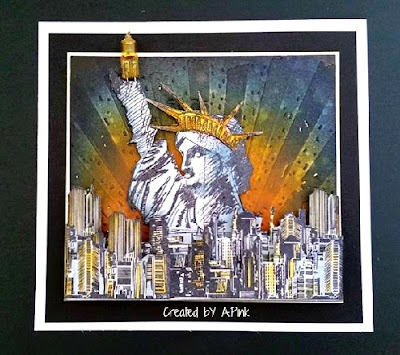 Big congrats to Ana for being our random winner with her stunning project and I adore the projects from our three pin worthies. Fantastic projects ladies, you rock!! A beautifully Canvas! 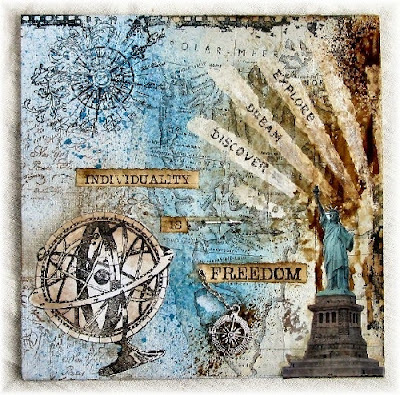 Monika Love the crackle and stenciling and the delicate hues . Your daughter must be delighted with it . Wow! What a fabulous surprise for me to see my work chosen for a pinworthy mention! Thank you so so much to all the AVJ Creative Guides for appreciating my creativity and making my day !! I am So thrilled! Fantastic inspirations as always and what a honor I'm under the pinworthies - thank you very much und my congrats to Ana, Jan and Amanda! Wow Monika what a beautiful canvas, love your crackles and dreamlike look to your design. It's so pretty. Beautiful canvas, Monika! 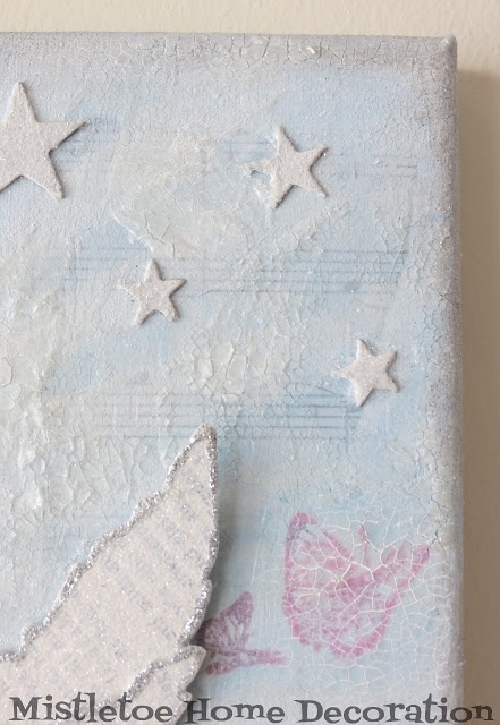 The background is so dreamy and soft and what a lovely piece for your daughter's room! congratulations to the Ana, Amanda, Kerstin and Jan! Wow! What fantastic artwork you have created! Great choices by the Creative Guides! Beautiful canvas by Monika, I'm sure her daughter loved it! Congratulations to Ana K on her win and to the three Pinworthies Amanda, Kerstin and Jan,wonderful projects from one and all! Nice to meet you Monika, your angel is beautiful! So happy to see my name here. Thank you! …and congratulations to all winners...so well deserved! !